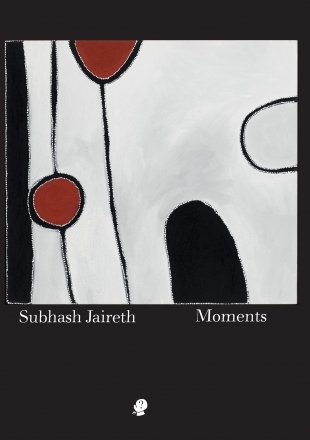 Moments by Subhash Jaireth was launched by Professor Jen Webb at the National Library of Australia Bookshop, Canberra on 8th October 2015. I first came across Subhash through his writings, nearly two decades ago. At the time I was reading a lot of John Berger’s work, and he was doing some writing on Berger; and I found in Subhash’s essays, and later in his creative writing, something of the same accent, or dialect: a fluent but meticulous mode of expression; a delicate wistfulness combined with threads of optimism; the capacity to recognize beauty in the most unexpected of places. I am flying a kite here, but I have wondered, from time to time, if it mightn’t have been his training in geology that gives him the ability to see the strata of things, and their texture; to understand both depth and surface; and the patience to chip away at the world until it discloses its nature. Subhash is a prolific writer, across several genres; critical prose, poetry, long and short form fiction, and nonfiction, as well as works for theatre. He is also a translator, with a feel for language, and its sonorities and cadences; and a sense of how culture infuses communication—a sense that, I suspect, comes from moving between linguistic modes. As I read him, and listen to him, it seems to me that he sees the world in a variety of ways, and then communicates what he sees in a lyrical voice: sometimes delicately limpid, sometimes densely recursive, always observant and insightful. This new collection of stories announces its focus in the title, Moments. It comprises a series of vignettes about moments in the lives of mostly famous people, who are mostly located during, or bearing the traces of, of what Roger Shattuck called ‘the banquet years’: the fin de siècle, from the mid-1880s to world war 1, and thus the birth of the avant garde. The title also reflects the narrative structure of these pieces; to me they have the effect of light scattered by a prism. They don’t simply recount the ‘chopped-up tapeworm of time’ (to use EM Forster’s phrase for plot). Instead, they weave to and fro, across time, across space, building a portrait of a life, or lives out of glimpses; using elements drawn from impressionism, or cubism, reflecting the avant garde than of the classic traditions of story. The individual pieces are told, for the most part, obliquely; usually by someone other than the famous person who is the foundational character, and often with that famous person being on the edges of the narrative. This technique makes me think for just a second of Tom Stoppard’s Rosencrantz and Guildenstern are dead: a story told in the wings, where what is minor takes our attention, and meantime the giants of the stage act on, almost out of our view. It can also be read as a puzzle book: Subhash seems to be playing with us the child’s Twenty Questions game, so that readers are teased to work out the identity of many of the characters that populate these stories. It isn’t necessary to know who they all are; they work as stories nonetheless; but once the characters are draped in the garments of their historical referents, they take on more complexity, more colour, and are perhaps better able to convey the clash between the vibrancy and violence of those decades, and the tenderness, the poignancy, of the lives being lived. This mixed emotional texture is probably inevitable, because that period heralds the death of established ideas and practices, and the birth of something radically new. Subhash’s stories take us into that space of vivid potential and deep loss, and are peopled by reflections of individuals who lived then: those giants of art and philosophy, who so often put all their brilliance into their works rather than their lives. The stories treat cellist Pablo Casals (b.1876); philosopher Walter Benjamin (b.1892); sculptor Henri Laurens (b.1885); writers Anna and Fyodor Dosteovsky (b.1846 and 1821 respectively); the radical avant garde artist Atsuko Tanaka (b.1932); that complex philosopher, Martin Heidegger (b.1889); the Jewish poet Paul Celan (b.1920); and others. These are names to conjure with: names of people who have been written about, their lives and works dissected, for decades now. Subhash adds something new to this literature. His ‘fictional autobiographies’, as he names them in the preface to the book, add in what he calls ‘emotional fibre’. And more than that: for me, they add in the flavour of a place, and a period; they offer reminders of human potential, and of the political, social, familial and other pressures that go to shape us and make us. They also draw attention to what I nervously call ‘truth’, or truth’: those recondite things we call love and memory and friendship and creativity and death; the things that make up a life, and allow the threads of that life to be woven in to others. As they are woven, through these stories: Tolstoy, for instance, appears in the story of the Dosteovskys as well in his own; Pablo Casals – also called Pau – appears in his own story, and then is mirrored by a Pau who appears in the story of Walter Benjamin; Atsuko Tanaka has a bit part in Cunningham’s story; and so on, in a series of hints and gestures that flow through the book. Not only do the characters share fragments of each others’ tales; they also have in common a capacity to make and/or recognize things of beauty, things of art, while acknowledging that it cannot be fully defined, or contained. Pau, for example, is disabused of his notion that the beautiful is important when he meets, on the beach, Juanita, a little girl who is collecting shells. Pau agrees with her that she has collected a lot of shells—‘and aren’t they all beautiful?’, he says. Juanita disagrees, ‘and looked at me as if I had erred again. She pointed at those she thought were truly pretty. … She touched each of them, the pretty and the not-so-pretty, and sang a little ditty for each of them as if they were little creatures’ (page 18). This encounter reminds Pau, pointedly, that beauty is neither gnomic nor numinous; that it is not the necessary thing that fills and empties us. Rather, it ‘merely is’, part of the fabric of the beautiful and the not-beautiful—woven together, of equal value—that makes up the world. Pau’s story is gentle, full of light and the pursuit of love, beauty, truth. The one that follows it, on Walter Benjamin, shifts the emotional texture to despair, and the juxtaposition of these stories creates a kind of chiaroscuro. Benjamin’s narrator, Margaret, notes that ‘death, unexpected, violent and tragic, must have become a leitmotif of Walter’s life’ (page 24). Indeed, she thinks, pursuing her reflections on that terrible period of history, and the sorrows of his life and her own, depicts death as a seducer, one who pretends to be a friend but ‘not only trips you, breaks your favourite toys and spills your soup, but is ready to push you off the cliff’ (page 25). Be on your guard, his story warns; and yet, despite everything, she finds the capacity to go on—the capacity Benjamin himself did not possess. The characters in these eleven stories share the need to pursue art, and the extraordinary in art. For sculptor Henri Laurens, who is the narrator of the third story in the collection—‘He likes Picasso but loves Braque’, the art is in observing the world so that the world will disclose itself to the artist. ‘However to merely observe the world around him wasn’t enough. He wanted to learn how to anticipate the moment when something novel, something truly magical, was about to reveal itself’ (page 36); and to achieve that revelation, one needs to connect with others: ‘his daily meetings with Braque, he was convinced, were helping him move closer to this cherished objective’. While these stories examine death and loss very closely, and colour the worlds of the stories with the practice and pursuit of art, they do not lose sight of the central and signal importance of love, affection, connection between human beings, and between humans and the natural world. The revelations sought explicitly by Subhash’s version of Laurent, and implicitly by the others, initiate artworks that allow the characters to endure the hardness of things. The story that draws on the life of dancer and choreographer Merce Cunningham (b.1919) is an example of this. Its narrator, Visnu Mahalingam, introduces readers to a dancer, Lara, who had been Cunningham’s student, and who was Visnu’s love. He travels with Lara and her troupe of performance artists to Chile, at the time of the first great September 11 horror—the CIA-assisted coup against Allende. In the upheavals that followed, they are all arrested, and Lara dies in custody. Telling this story, years later, Visnu writes about the effect that art can have on the heartbroken. Listening to a recording of ‘Two Sounds’, a composition by avant garde artist La Monte Young, which was used by Merce Cunningham in his Winterbranch, Visnu achieved what could be called an epiphany, but I think is better called simply a realization. His realization is that art has helped him carry the grief, ‘that if I have stopped grieving it isn’t because I have stopped feeling sad but because the sounds have kept the grief alive but bearable’ (page 94). Subhash is treading difficult ground in the writing of these stories. He has taken as his subjects real people who exist in history; and has placed them on a stage whose sets and props come largely from his imagination. By treating their historical stories in a fictional way, he is doing what Kate Grenville did in The Secret River, when she roused the ire of historians who were disgruntled by the idea that the boundary between history and fiction might be broached. Mark McKenna¹, for instance, complained that novelists are attempting to ‘elevate fiction to a position of interpretative power over history’. Certainly historians are responsible for the interpretation of the historical evidence, but they cannot be in control of history: it cannot be controlled, or owned, by any category of person. The writers of fiction too take up the task of reflecting on the past, and provided they make it clear to their readers that they are in the presence of imagined worlds, peopled with what Roland Barthes called ‘paper beings’, I see no struggle with history, no assault on the work of historians. The task of the writer of fiction is, surely, not to interpret historical facts predicated on archival evidence, but to provide insights into, and understandings of, the feeling of being. I can’t say whether or not Subhash’s stories get to the facts of the people they treat; but to my mind they get to the facticity of the world. They convey the feeling of its qualities, and provide a sense of how people live in the world, and die, and are remembered; how they engage with each other and with art; and how this cobweb of co-existence forms a secure foundation for us, living in the here and now. ¹ Mark McKenna, ‘Writing the past: history, literature and the public sphere in Australia’, Australian Financial Review, 16 December 2005, 1−2, 8. Rochford Street Review will be reviewing Moments in the near future. This entry was posted in Issue 16, Jen Webb, Moments, Puncher & Wattmann, Subhash Jaireth and tagged Australian Fiction, Fiction, John Berger, literature, Mark McKenna, Roger Shattuck by Mark Roberts. Bookmark the permalink.